Joining UNISON allows you to democratically participate in changing the workplace for the better. Joining a union is the only way to secure positive changes within the workplace. 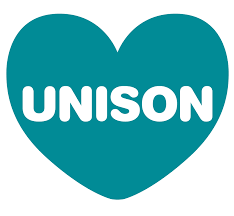 UNISON is the largest public and voluntary sector union in Europe, representing 1.3 million members. It is the only union in the UK that has managed to continue to grow in the climate of austerity. UNISON is also unique in its reflection of self-organised members groups. These are for our black members; disabled members; lesbian, gay, bisexual and transgender members; and women members. We also have equality groups for young members and retired members. What can UNISON do for me? The support that UNISON provides is made possible by our members who stand to become activists. If you would be interested in getting involved then further information is available here. UNISON activists can provide advice and representation to members who encounter a problem at work. Activists throughout the union also campaign for improved terms and conditions in their workplaces.